Iver Environment Centre has been on my list of places to visit for some time. We frequently pass it on the way to Uxbridge. I’ve seen various activities advertised during school holidays but we never quite managed to do any of them. This week, they had an Open Gardens session which sounded like the perfect opportunity to finally pay a visit. Sophie immediately took charge of the map we were given and headed off to explore. I was quite happy to follow as she decided which way to go at every turn. 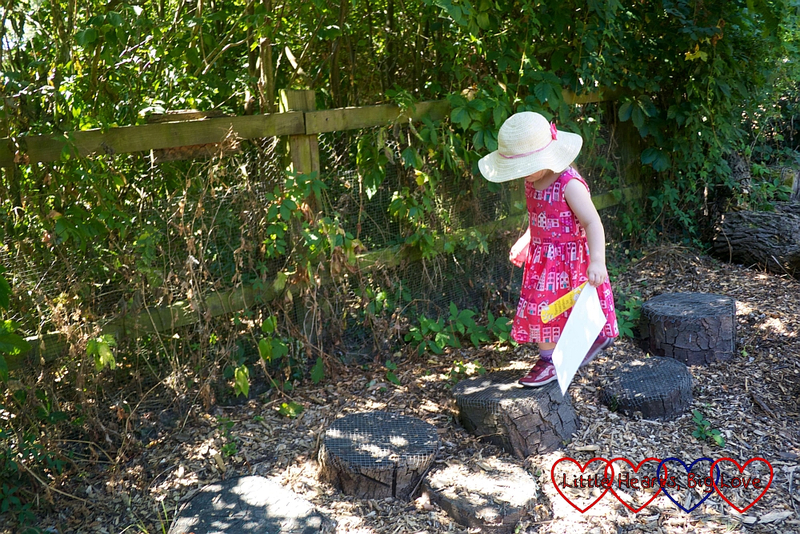 There are various different areas at Iver Environment Centre to explore. 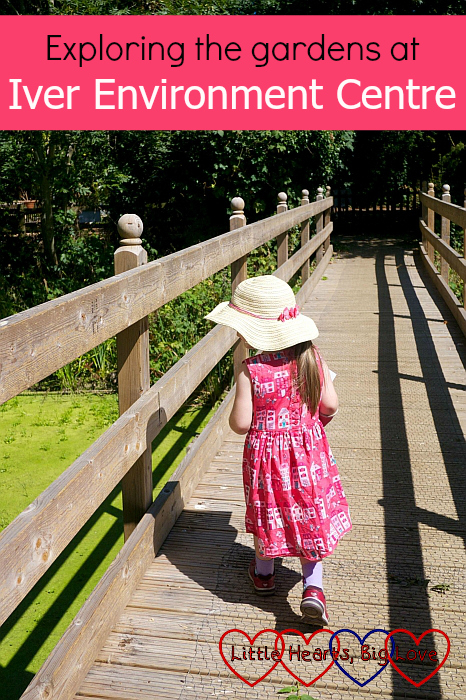 Sophie took us across the bridge over the pond, through the vegetable gardens and into the Garden of Time. 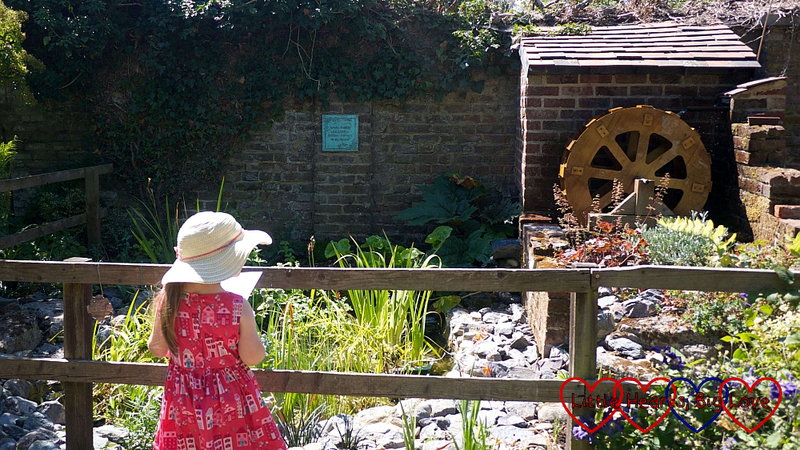 We stood for a moment to watch the water wheel turning next to the pond. I loved the sign on the wall – “walk softly and listen – Mother Nature is at work”. A beautiful reminder of the importance of just being still and enjoying a few moments outdoors. 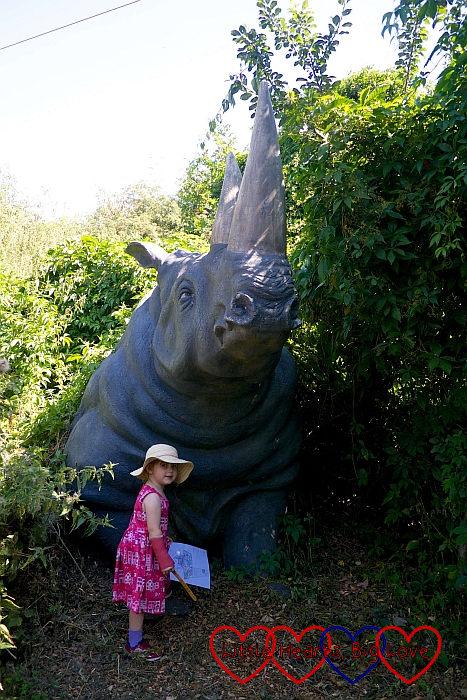 The path from the Garden of Time took us to the obstacle course where we also encountered a giant rhino! We were later told that there is a slide here although we didn’t notice it at the time – something to look out for next time. Sophie loved the log stepping stones. She was quite happy just walking back and forth over them for a while. I love how simple things like this can be so much fun for children. The bug hotel a little further along the path didn’t quite manage to hold her interest though. 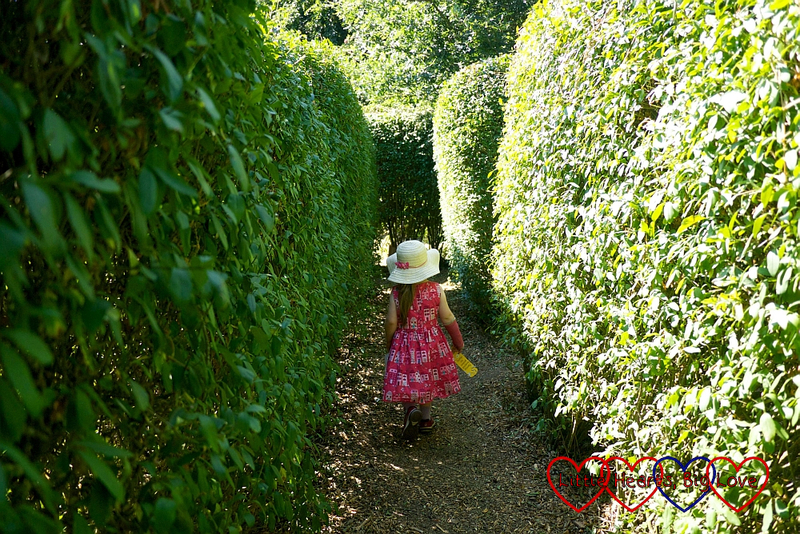 We couldn’t resist trying to find our way through the maze. I have to admit I’m always a bit nervous about getting lost in mazes. Thankfully this one was very small and although I think we did manage to turn down all the dead ends, we had no problem making our way through it! 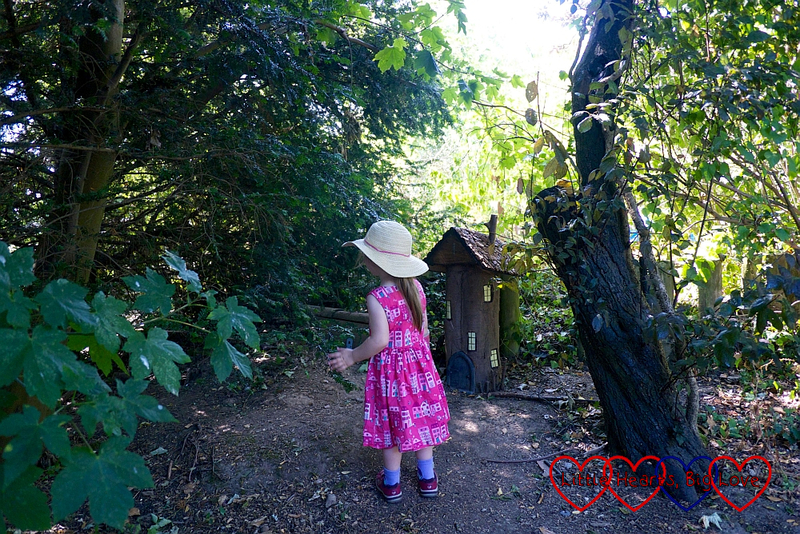 Sophie loved the fairy houses that she spotted in one of the forest play areas. 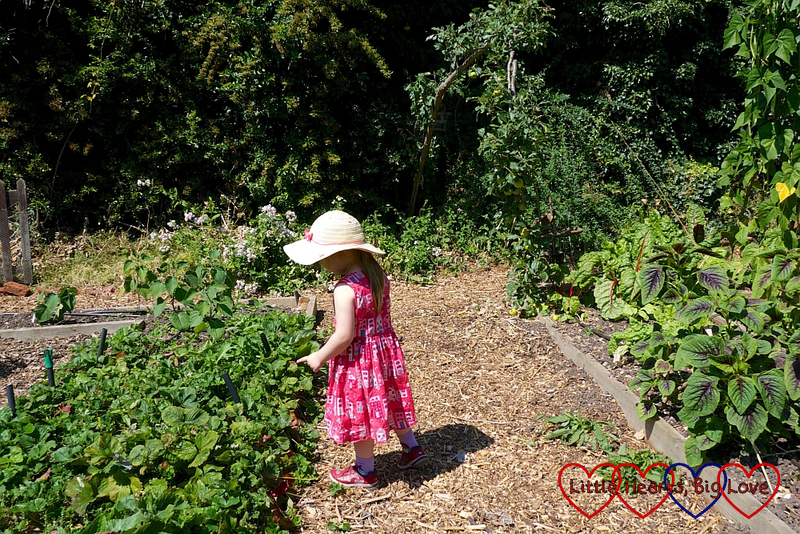 We headed back through the vegetable gardens and made our way to the outdoor cooking area. There were several dens set up around the cooking pot. Naturally Sophie had to explore each one in turn. The rainforest polytunnel nearby was a big hit. There were pictures of various animals to look out for along the way and fish to watch in the pond. It was a wonderful place to spark a little adventurer’s imagination. 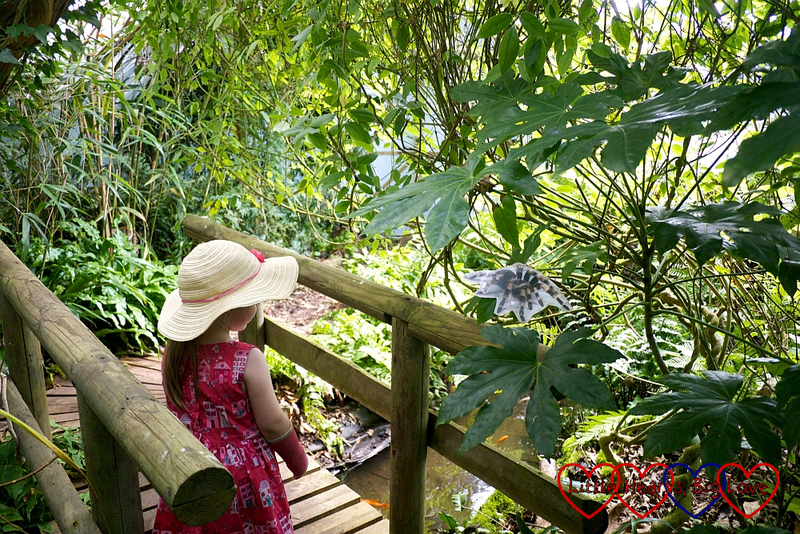 “Watch out for that big spider, Mummy!” We tiptoed carefully through as we passed tarantulas, tree frogs and monkeys. I think Sophie’s favourite place though was the orchard where there were some more children’s toys set up. 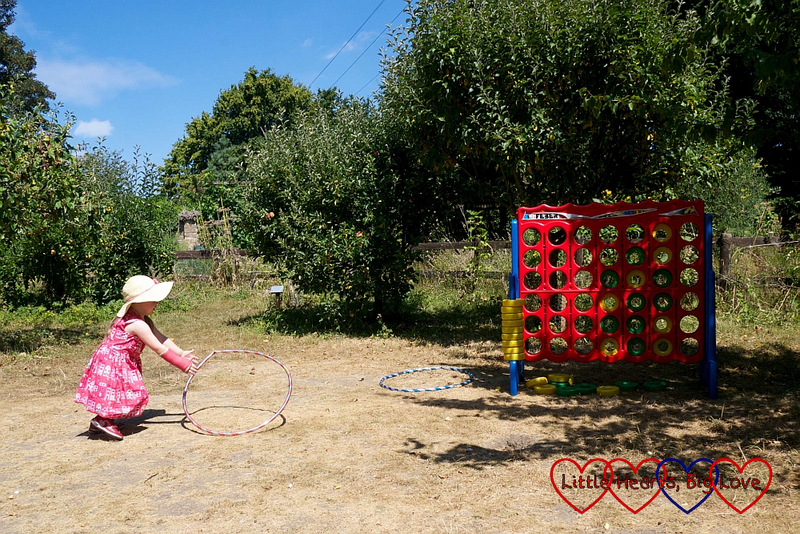 She spent ages playing with the hula hoops there – trying to twirl them around her waist, spinning them across the grass, using them to skip through. Another simple activity that provides so much fun. I must get her one at some point. There were some metal pots near by which were great for making echoes with. Sophie had lots of fun shouting into them and listening to the echo. 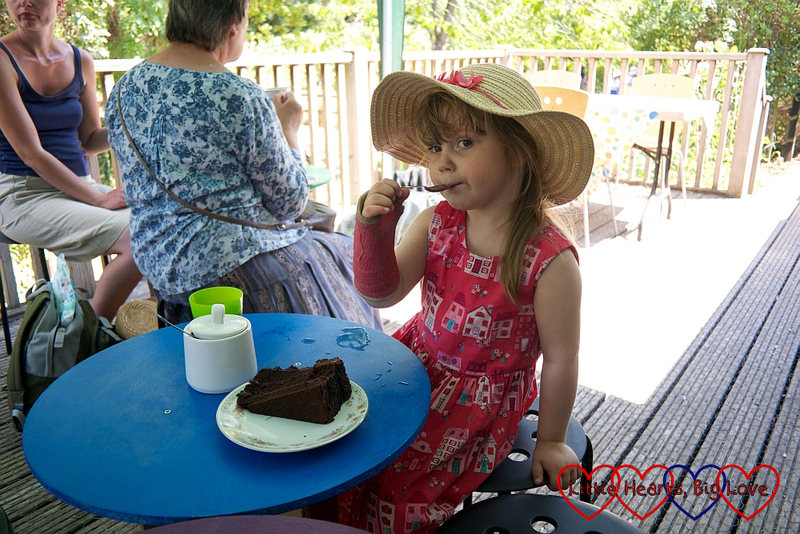 We finished off our visit with some tea and cake. Sophie thoroughly enjoyed her slice of chocolate cake! Iver Environment Centre are running various family activities on Wednesdays, Thursday and Fridays in August. 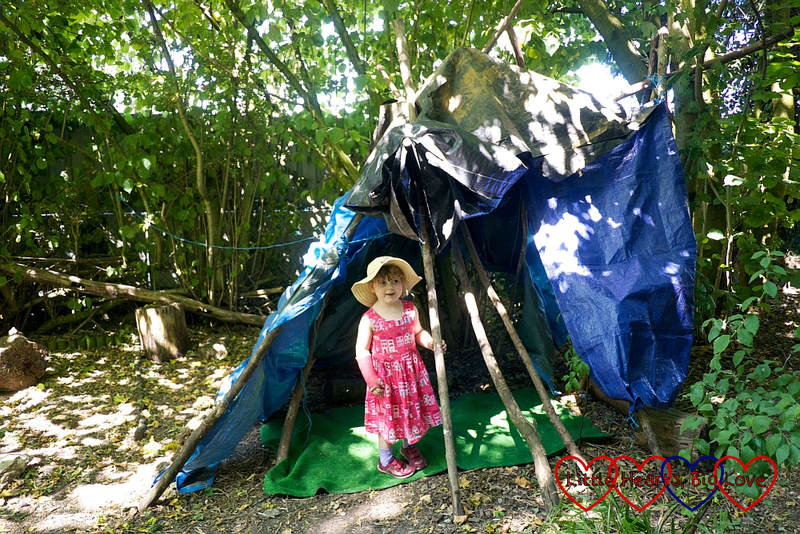 These need to be pre-booked and include pond dipping, bug hunts, den buildings and outdoor cooking sessions. Hopefully we’ll manage to make a return trip at some point over the summer as Sophie would love taking part in some of these. What a lovely looking place and so many good ideas in here I am squirreling away for Coombe Mill. I adore the Mother nature at work sign, I’m definitely copying that one for my kindness trail, it’s perfect! the little fairy houses look adorable too. That could be more of Farmer Nick’s logs in danger! 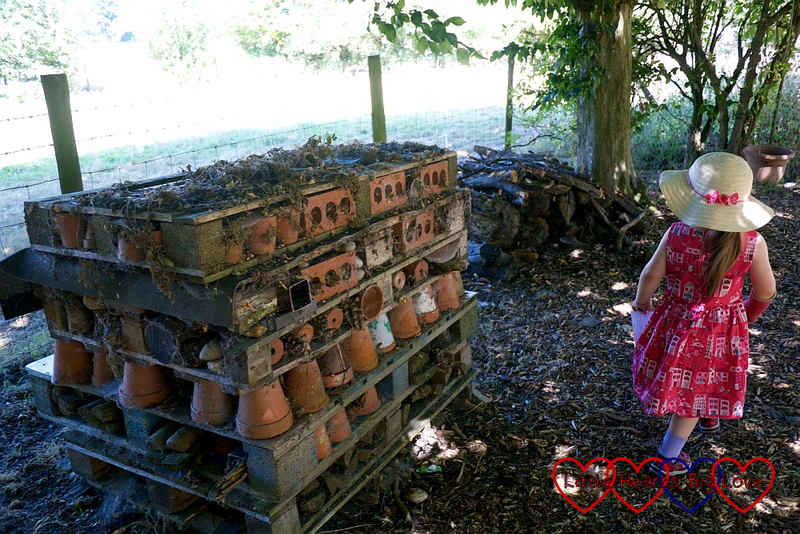 Our bug hotel tends to get by passed too, the silly thing is the bugs much prefer to live under the fairy houses! Echo tubs is a wonderful idea. I’ve never heard of Iver Gardens before but what a delight they are. Massive congratulations on the safe arrival of Thomas, what a busy week ahead you have with Country Kids too, but ask me for help at any time. Off to vote for you in the BIBs, this is your year! 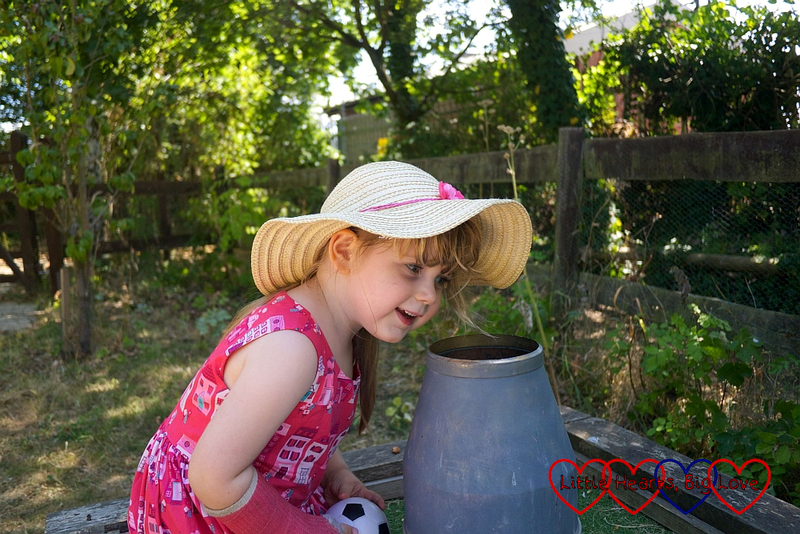 Thank you for linking up to and taking on #CountryKids for me. You are going to make a great host for the linky, I’m so pleased you can take it on. Yes simple things appeal to children of that age and their imagination adds a lot to a day out. Love how she took charge of the map. the joy of having only one child with you. Lol a picture wasn’t too bad – a real one would definitely have put me off! I keep meaning to make one for ours too – maybe one day I’ll get around to it! Hi do you know if you can visit anytime during the week just to explore? There website isn’t really clear… I know there are certain activities that need to be booked but they don’t have any opening hours on their website and google just says open 10am to 3pm? But I’m not sure if thats just their offices or if that means they are open to the public? Was hoping to visit tomorrow so if you could shed any light that would be very helpful!